The first, and a very important step that I try to do every day is to take my make-up off as soon as I arrive home. It is a lot better for your skin and I really notice the difference when I follow this rule. For cleansing I used to use the famous Bioderma micellar water, but at some point I noticed that it was breaking me out. After reading the ingredients I understood that it contained propylene glycol that my skin reacts really bad to. Though I must say that Bioderma is a really good cleanser and I still sometimes use it when taking off the eye make-up. So I decided to go look for some micellar waters that did not have propylene glycol in them and I found this La Roche-Posay one (1) that I felt in love with and I have used probably 4 bottles of it. I really like that this is such a non-greasy way to take off your make-up during the summer and early autumn/late spring, when the weather is warmer and my skin tends to get more oily. 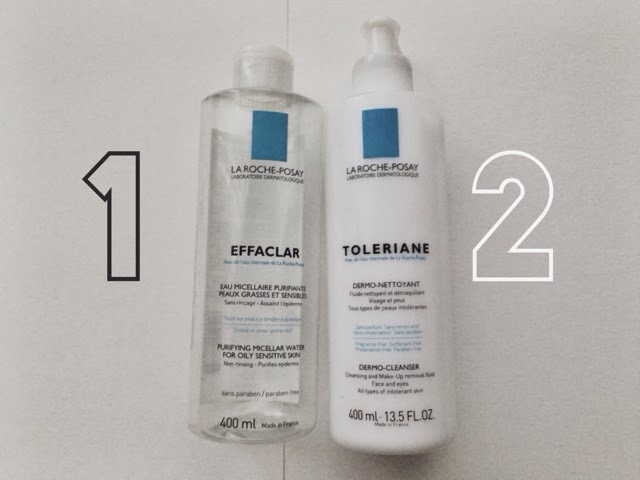 But as the temperature was getting down I felt that I needed something more nourishing, so I went to La Roche Posay again, as I find that their products do not usually break me out (but only the ones that do not have any mineral oil or propylene glycol in them). 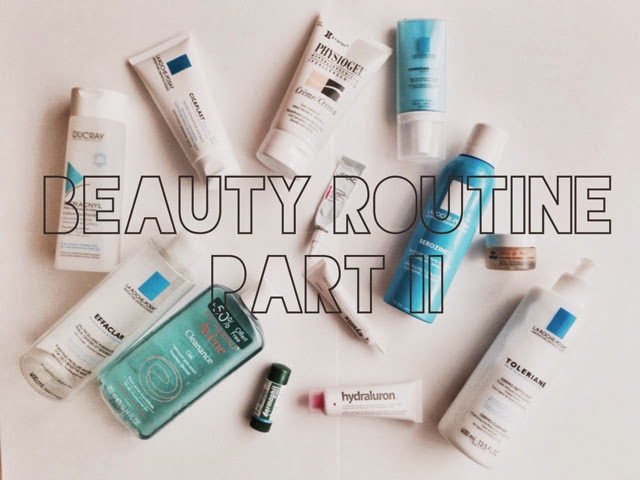 So, instead of the micellar water, I recently started using Toleriane Dermo-Cleanser (2), which is a cleansing milk. It has a really nice texture, not as light as a micellar water, but not as rich as a cleansing balm can be. I am still skeptical about face balms, even though everybody is raving about them, as I am scared that it can clog my pores or cause breakouts. But I kind of took the whole balm-hot-water-muslin-cloth system and changed it a bit by replacing the balm with the milk and I should say it works really nice. After my skin feels hydrated, but not greasy. Then I'll use some Avene thermal water (3) instead of the Serozinc one that i use mostly in the morning. It just feels that it is more hydrating and soothing, and more appropriate for a night time use. Finally, I just put on some moisturizer. 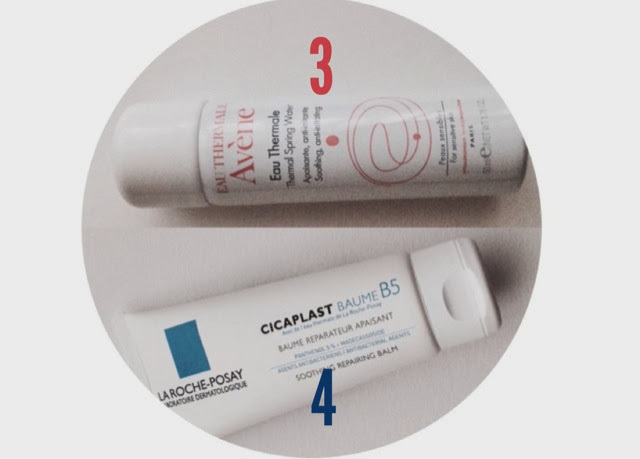 The one that I use most often for the night time is Cicaplast Baume B5 by La Roche Posay (4). It has a super rich texture, but it had never-ever-ever broken me out and it is very calming and soothing especially if your skin tends to look reddish or pinkish after being in the cold or even in the sun. That is about it for my night time routine and I hope it will help someone who has the same skin issues as me.